I am so absolutely delighted that my teapot is finally done! After the graduation ceremony, my entourage accompanied me at my studio and waited patiently while I finished the handle and set the final rivets. It looked fantastic and I was so happy to share that triumphant moment with my dear friends! 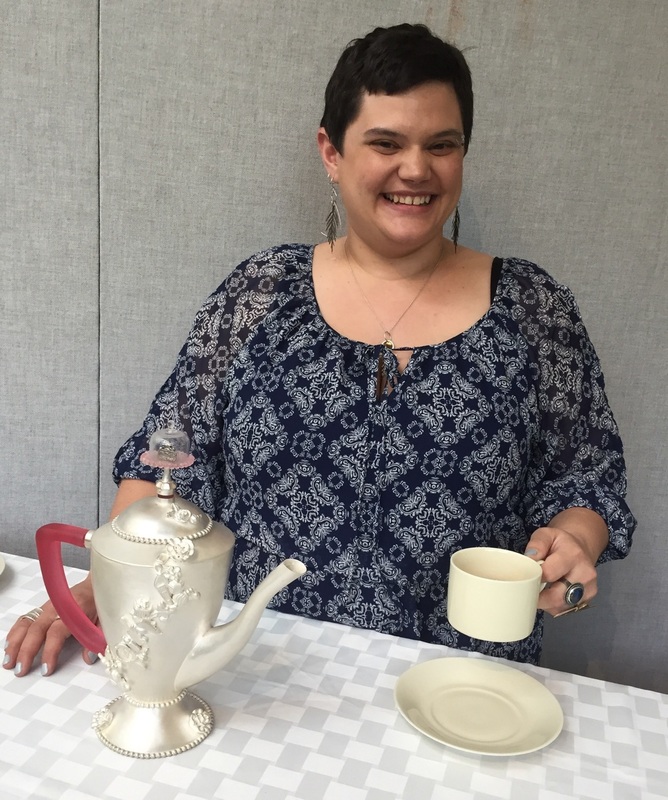 The following day was the annual tea party, and I was honored to be included in the day's festivities along with the talented ladies in Christine Clark's teapot class. I served Steven Smith's Lord Bergamot tea, my favorite! I'm getting some professional photos taken now, so I hope to have my teapot featured on the main part of the website soon! I'm really looking forward to taking a short break from the intensity of the studio. I plan on picking a lot of berries this summer and spending a lot of time at the beach, swimming, taking walks and enjoying life at a much slower pace now. Time to decompress! But stay tuned, because I have many more ideas and pieces I want to work on once I've given myself a little break, and this is where you'll find my process pics and other interesting stuff. Thanks! 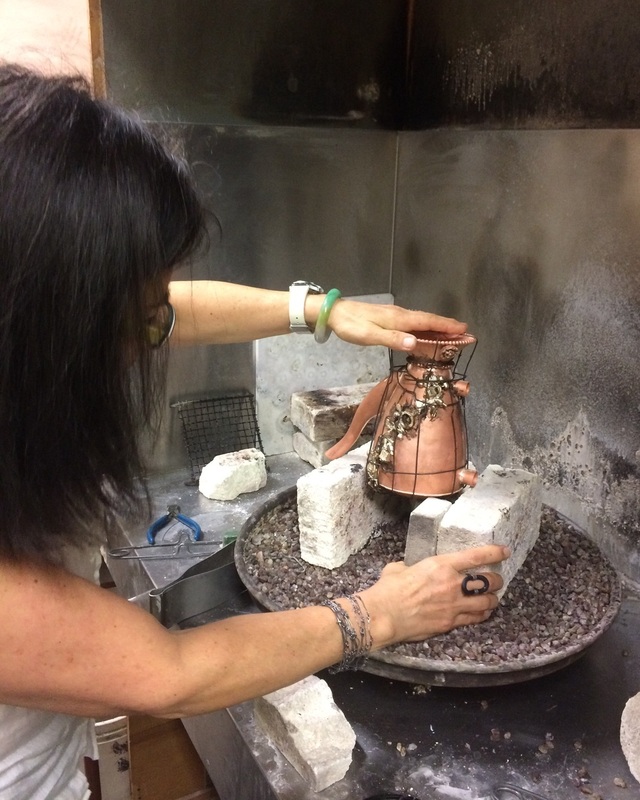 Today was another huge step in the finishing process of this cake pot--plating the copper and bronze with a thin layer of sterling silver. This is a dangerous process involving lots of nasty chemicals, an electric current and a lot of fiddling around with anodes. I am truly grateful to my good friend who knows the process well and helped me (really, he did all the work and I just assisted him). I don't even know how to thank him, except like a typical Alaskan: by giving him some salmon. Here he has just plated the lid. That stuff that looks like water is actually cyanide with fine silver anodes. Here it is after one coat. I scrubbed it really well to remove some residue and then we gave it another good plating. It took way longer than I thought it would--I should have guessed that because I know that's the way most processes go. The plating itself doesn't take long but all the setup and metal prep does take quite a while. I had to run to work but here are all the pieces ready for me to polish a little. I'm so excited to go back to the studio and polish it up. Next up: working on the handle! Such a productive day! Made an appointment with my professor and today we bound and soldered all the cast minis and the base onto the body. This is a HUGE moment! It's finally all soldered in place--no more hot glue or sticky wax holding it together! Then I faced and overcame my fears and soldered a closed form by myself-- two different parts actually-- and both times it flowed like a dream and nothing exploded (yes that is a concern)! So relieved to be (mostly) done soldering on this beast. I just have one little flower that needs to be tacked back on, but I have a plan for how to tackle that tomorrow. So excited that I just had to share my progress and excitement! After a short break, I am finally ready to get back to my teapot. Our teaparty is scheduled for May 15, so I really have to push to bring all the components together, now! You can see the pink resin handle that I cast today. I did some rudimentary cleanup on it before getting back to my computer tasks, but I think it's going to work. The cast bronze objects and beadwire are all just glued in place for now. We visited Smith Teas last week with all our in-process teapots hotglued together to give Claire, their tea master, an idea of what they would look like. She worked with us to find just the right tea to match our teapots. After I told her about my cakepot of feminine charms, she chose Lord Bergamot for me-- I was so tickled because Early Grey is my favorite! 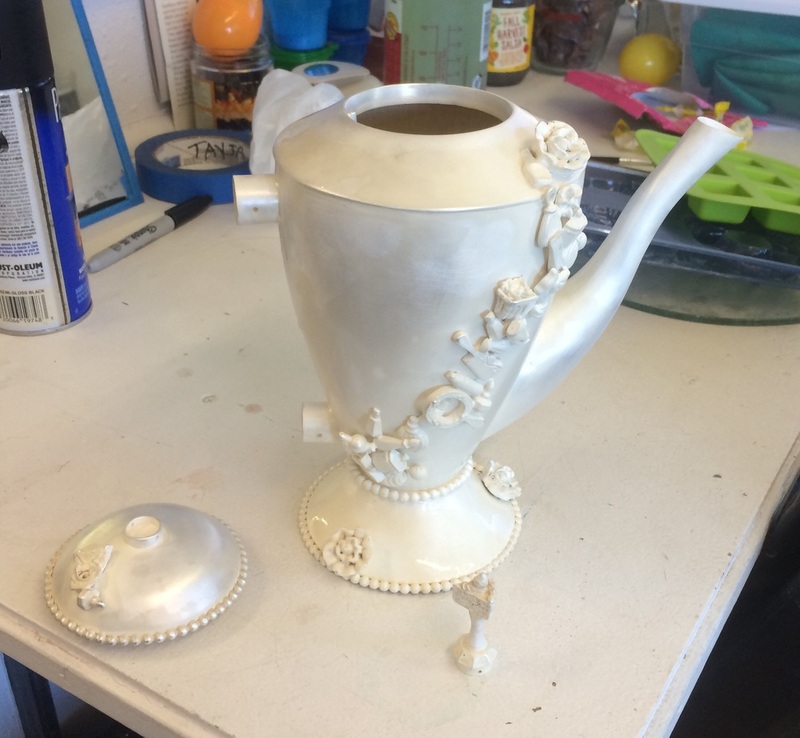 So now the real work begins-- cleaning up all those cast elements, tinning them with silver solder, and somehow getting them to stay in place while I solder them onto the teapot itself. I also have to get to work remaking the lid, which met an untimely demise last fall. Sure wish soldering was as easy as hot glue!